Not to be confused with Landing (water transport) or Splashdown (disambiguation). "Ditching" redirects here. For the intentional absence from school, see truancy. A water landing is, in the broadest sense, a landing on a body of water. Some aircraft such as floatplanes land on water as a matter of course. The phrase "water landing" is also used as a euphemism for crash-landing into water an aircraft not designed for the purpose, an event formally termed ditching. In this case, the flight crew knowingly make a controlled emergency landing on water. Ditching of commercial aircraft is a rare occurrence. Seaplanes, flying boats, and amphibious aircraft are designed to take off and alight on water. Alighting can be supported by a hull-shaped fuselage and/or pontoons. The availability of a long effective runway was historically important on lifting size restrictions on aircraft, and their freedom from constructed strips remains useful for transportation to lakes and other remote areas. The ability to loiter on water is also important for marine rescue operations and fire fighting. One disadvantage of water alighting is that it is dangerous in the presence of waves. Furthermore, the necessary equipment compromises the craft's aerodynamic efficiency and speed. While ditching is extremely uncommon in commercial passenger travel, small aircraft tend to ditch slightly more often because they usually have only one engine and their systems have fewer redundancies. According to the National Transportation Safety Board, there are about a dozen ditchings per year. General aviation includes all fields of aviation outside of military or scheduled (commercial) flights. This classification includes small aircraft, e.g., training aircraft, airships, gliders, helicopters, and corporate aircraft, including business jets and other for-hire operations. General aviation has the highest accident and incident rate in aviation, with 16 deaths per million flight hours, compared to 0.74 deaths per million flight hours for commercial flights (North America and Europe). The FAA does not require commercial pilots to train to ditch but airline cabin personnel must train on the evacuation process. In addition, the FAA implemented rules under which circumstances (kind of operator, number of passengers, weight, route) an aircraft has to carry emergency equipment including floating devices such as life jackets and life rafts. Some aircraft are designed with the possibility of a water landing in mind. Airbus aircraft, for example, feature a "ditching button" which, if pressed, closes valves and openings underneath the aircraft, including the outflow valve, the air inlet for the emergency RAT, the avionics inlet, the extract valve, and the flow control valve. It is meant to slow flooding in a water landing. On 11 April 1952, Pan Am Flight 526A ditched 11.3 miles northwest of Puerto Rico due to engine failure after take off. Many survived the initial ditching but panicking passengers refused to leave the sinking wreck and drowned. 52 passengers were killed, 17 passengers and crew members were rescued by the USCG. After this accident it was recommended to implement pre-flight safety demonstrations for over-water flights. On 16 April 1952, the de Havilland Australia DHA-3 Drover VH-DHA operated by the Australian Department of Civil Aviation with 3 occupants was ditched in the Bismarck Sea between Wewak and Manus Island. The port propeller failed, a propeller blade penetrated the fuselage and the single pilot was rendered unconscious; the ditching was performed by a passenger; all 3 occupants survived. On 3 August 1953, Air France Flight 152, a Lockheed L-749A Constellation ditched 6 miles from Fethiye Point, Turkey 1.5 miles offshore into the Mediterranean Sea on a flight between Rome, Italy and Beirut, Lebanon. The propeller had failed due to blade fracture. Due to violent vibrations, engine number three broke away and control of engine number four was lost. The crew of eight and all but four of the 34 passengers were rescued; the other 4 passengers died. On 19 June 1954, Swissair Convair CV-240 HB-IRW ditched into the English Channel because of fuel starvation, which was attributed to pilot error. All three crew and five passengers survived the ditching and could escape the plane. However, three of the passengers could not swim and eventually drowned, because there were no life jackets on board, which was not prescribed at the time. On 26 March 1955, Pan Am Flight 845/26 ditched 35 miles from the Oregon coast after an engine tore loose. Despite the tail section breaking off during the impact the aircraft floated for twenty minutes before sinking. 4 died but 19 survivors were rescued after a further 90 minutes in the water. On 2 April 1956, Northwest Orient Airlines Flight 2 (a Boeing 377) ditched into Puget Sound after severe buffeting and altitude loss that was later determined to have been caused by the failure of the crew to close the cowl flaps on the plane's engines. All aboard escaped the aircraft after a textbook landing, but four passengers and one flight attendant succumbed either to drowning or to hypothermia before being rescued. On 16 October 1956, Pan Am Flight 6 (also a Boeing 377) ditched northeast of Hawaii, after losing two of its four engines. The aircraft circled around USCGC Pontchartrain until daybreak, when it ditched; all 31 on board survived. On 23 September 1962, Flying Tiger Line Flight 923, a Lockheed 1049H-82 Super Constellation N6923C, passenger aircraft, on a military (MATS) charter flight, with a crew of 8 and 68 U.S. civilian and military (paratrooper) passengers ditched in the North Atlantic about 500 miles west of Shannon, Ireland after losing three engines on a flight from Gander, Newfoundland to Frankfurt, West Germany. 45 of the passengers and 3 crew were rescued, with 23 passengers and 5 crew members being lost in the storm-swept seas. All occupants successfully evacuated the airplane. Those who were lost succumbed in the rough seas. On 22 October 1962, a Northwest Airlines DC-7C with 7 crew and 95 passengers made a successful water landing in Sitka Sound. The military charter flight was en route to Elmendorf Air Force Base from McChord Air Force Base and, prior to the ditching at just before 1 p.m. local time, the crew had been struggling with a propeller problem for about 45 minutes. The plane stayed afloat for 24 minutes after coming to rest in the water, giving the occupants ample time to evacuate into life-rafts. Only 6 minor injuries were reported; all passengers and crew were quickly rescued by U.S. Coast Guard ships. The accident report called the ditching "an outstanding feat," citing several key factors in this water landing's success: pilots' skill, ideal conditions (calm seas, favorable weather, daylight), time to prepare for the ditching and the military passengers' ease with following orders. Pilots who flew over the scene also praised the Northwest crew, calling it the "...finest ditching they had ever seen...". On 21 August 1963, an Aeroflot Tupolev Tu-124 ditched into the Neva River in Leningrad (now St. Petersburg) after running out of fuel. A nearby tugboat pulled the plane to shore where the passengers disembarked onto the tug; all 52 on board escaped without injuries. On 2 May 1970, ALM Flight 980 (a McDonnell Douglas DC-9-33CF), ditched in mile-deep water after running out of fuel during multiple attempts to land at Princess Juliana International Airport on the island of Sint Maarten in the Netherlands Antilles under low-visibility weather. Insufficient warning to the cabin resulted in several passengers and crew still either standing or with unfastened seat belts as the aircraft struck the water. Of 63 occupants, 40 survivors were recovered by U.S. military helicopters. On 2 June 1976, an Aeroflot Yak-40 ditched into the swamp in Kiev because of pilot error. All passengers and crew escaped without injuries. On 23 November 1996, Ethiopian Airlines Flight 961 (a Boeing 767-260ER), ditched in the Indian Ocean near Comoros after being hijacked and running out of fuel, killing 125 of the 175 passengers and crew on board. Unable to operate flaps, it impacted at high speed, dragging its left wingtip before tumbling and breaking into three pieces. The panicking hijackers were fighting the pilots for the control of the plane at the time of the impact, which caused the plane to roll just before hitting the water, and the subsequent wingtip hitting the water and breakup are a result of this struggle in the cockpit. Some passengers were killed on impact or trapped in the cabin when they inflated their life vests before exiting. Most of the survivors were found hanging onto a section of the fuselage that remained floating. On 31 May 2000, a Piper PA-31 Chieftain operating Whyalla Airlines Flight 904 ditched in the Spencer Gulf in South Australia at night after both engines failed. The very dark conditions and lack of visual reference complicated the landing and the pilot and all 7 passengers were killed. As a result of the accident regulations in Australia now require that all aircraft carrying paying passengers over water carry life jackets and survival equipment. On 16 January 2002, Garuda Indonesia Flight 421 (a Boeing 737) successfully ditched into the Bengawan Solo River near Yogyakarta, Java Island after experiencing a twin engine flameout during heavy precipitation and hail. The pilots tried to restart the engines several times before making the decision to ditch the aircraft. Photographs taken shortly after evacuation show that the plane came to rest in knee-deep water. Of the 60 occupants, one flight attendant was killed. On 11 November 2002, Laoag International Airlines Flight 585 took off from Manila runway 31 at just after 6 o'clock for a flight to Laoag and Basco Airport (BSO). Shortly after takeoff engine trouble developed in the aircraft's left engine. The pilot declared an emergency and tried to land the plane but decided at the last minute to ditch into the sea. The aircraft broke up and sank in the water to a depth of about 60 feet. 19 of the 34 occupants were killed. On 6 August 2005, Tuninter Flight 1153 (an ATR 72) ditched off the Sicilian coast after running out of fuel. Of 39 aboard, 23 survived with injuries. The plane's wreck was found in three pieces. On 15 January 2009, US Airways Flight 1549 (an Airbus A320) successfully ditched into the Hudson River between New York City and New Jersey, after reports of multiple bird strikes. This event is sometimes referred to as "miracle on the Hudson", as all of the 155 passengers and crew aboard escaped and were rescued by passenger ferries and day-cruise boats, in spite of freezing temperatures. The ditching occurred near the Circle Line Sightseeing Cruises and NY Waterway piers in midtown Manhattan. On 22 October 2009, a Divi Divi Air Britten-Norman Islander operating Divi Divi Air Flight 014 ditched off the coast of Bonaire after its starboard engine failed. The pilot reported that the aircraft was losing 200 feet per minute after choosing to fly to an airport. All 9 passengers survived but the captain was knocked unconscious and although some passengers attempted to free him, he drowned and was pulled down with the aircraft. On 6 June 2011, a Solenta Aviation Antonov An-26 freighter flying for DHL Aviation ditched in the Atlantic Ocean near Libreville, Gabon. All three crew and the one passenger were rescued with minor injuries. On 11 July 2011, Angara Airlines Flight 5007 (an Antonov An-24) ditched in the Ob River near Strezhevoy, Russia, after an engine fire. Upon water contact the tail separated and the burnt port engine became detached from its mounts; otherwise, the plane remained intact, but was written off. Out of 37 people on board, including four crew and 33 passengers, 7 passengers died. Of the survivors at least 20 were hospitalized with various injuries. Aircraft also sometimes end up in water by running off the ends of runways, landing in water short of the end of a runway, or even being forcibly flown into the water during suicidal/homicidal events. Twice at LaGuardia Airport, aircraft have rolled into the East River. 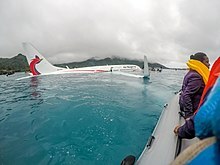 On 28 September 2018, a Boeing 737-800 performing Air Niugini Flight 73 landed in a lagoon short of Chuuk International Airport. One of the passengers died, but the 46 other crew and passengers were evacuated by boats. On 13 April 2013, Lion Air Flight 904, a Boeing 737-800 (registration PK-LKS) from Bandung to Denpasar (Indonesia) with 108 people on board, undershot runway 09 and ditched into the sea while landing at Ngurah Rai International Airport. The aircraft’s fuselage ruptured slightly near the wings. All passengers and crew were safely evacuated with only minor injuries. On 30 April 2002, DAS Air Cargo DC-10-30F freighter N800WR approached Entebbe, Uganda runway 35 following a flight from London-Gatwick carrying over 50 tons of cargo. The airplane landed long: 4000–5000 feet down the 12000-foot runway. The nosegear touched down 13 seconds after the main undercarriage. The DC-10 could not be brought to a halt and slid off the runway into Lake Victoria about 100 meters from the southern end of the runway. The DC-10 ended up with the no. 1 and 3 engines submerged and cockpit section separated from the fuselage. The crew members were rescued with a life raft within just 10 minutes of the accident. On 3 February 2000, Trans Arabian Air Transport Flight 310, a Boeing 707-351(C) carrying cargo, grossly overshot the landing strip at Mwanza Airport after a first attempt failed and eventually landed in the middle of Lake Victoria. The plane continued floating after the landing and all five crew survived, some with light injuries. On 12 September 1993, while landing in poor weather conditions at Faa'a International Airport, Papeete, Tahiti, a Boeing 747 conducting Air France Flight 072 hydroplaned, overshot the runway and ended up with its nose in a lagoon. All 272 passengers and crew evacuated successfully, even though the engines were still running and there was a risk of ingestion. In 1993, China Airlines Flight 605, a Boeing 747–409, ended up in water after it overran runway 13 at Kai Tak International Airport on landing during a typhoon with wind gusting to gale force. All of the 396 occupants donned life-vests, boarded the eight slide/rafts and no fatalities resulted. The airframe remained above water even after the aircraft was evacuated. In 1989, USAir 5050, a Boeing 737–401 with 63 people aboard, overran the runway while taking off from New York's La Guardia Airport, landing in the East River and breaking into three pieces, and sustained two deaths. In 1985, an American Airlines DC-10 taking off from Muñoz Marín Airport in Puerto Rico to Dallas-Fort Worth International Airport in Texas overran the runway and nosedived into a nearby lake. No one was injured. On 9 February 1982, Japan Airlines Flight 350 landed in shallow water in Tokyo Bay short of the runway on approach to Tokyo International Airport, after the captain engaged thrust-reversers due to mental illness. Crew members tried to stop him but were not fully successful. 24 of the 166 passengers and none of the eight crew members died. The captain was found not guilty of any crime due to insanity. On 23 January 1982, World Airways Flight 30, landing at Boston Logan International Airport after a flight from Newark, New Jersey, slid off the runway due to ice and landed in Boston Harbor. The cockpit area separated from the remainder of the fuselage at the first row of seats. Two passengers in the first row disappeared and were presumed dead, but the other 210 people aboard survived. In 1982, Air Florida Flight 90 went down in the icy Potomac river after taking off from Washington National Airport during a snowstorm without proper de-icing. Only 6 out of 79 passengers and crew survived the initial crash, with one of the survivors eventually drowning after helping others to safety. The plane also hit a bridge, killing four and injuring another four motorists. On 7 August 1980, a Tupolev Tu-154B-1 operated by Tarom Romanian Airlines ditched in the water, 300m short of the runway at Nouadhibou Airport (NDB/GQPP), Mauritania. 1 passenger out of 168 passengers and crew died. In 1978, National Airlines Flight 193, a Boeing 727 Trijet, unintentionally landed in the waters of Escambia Bay near Pensacola, Florida after coming down short of the runway during a foggy approach. There were 3 fatalities among 52 passengers and 6 crewmembers. On 22 November 1968, Japan Airlines Flight 2, a DC-8-62, landed short of the runway in San Francisco Bay on approach to San Francisco International Airport. There were no fatalities, and the aircraft itself was in good enough condition to be removed from the water, rebuilt, and flown again. The "water bird" emergency landing is a technique developed by the Canadian Forces to safely land the Sikorsky CH-124 Sea King helicopter if one engine fails while flying over water. The emergency landing technique allows the boat-hull equipped aircraft to land on the water in a controlled fashion. Beginning in 2013 and continuing into 2014 and 2015, a series of ocean water landing tests were undertaken by SpaceX as a prelude to bringing booster rockets back to the launch pad in an effort to reuse launch vehicle booster stages. Seven test flights with controlled-descents have been conducted by April 2015. Prior to 2013, successful water landings of launch vehicles were not attempted, while periodic water landings of space capsules have been accomplished since 1961. The vast majority of space launch vehicles take off vertically and are destroyed on falling back to earth. Exceptions include suborbital vertical-landing vehicles (e.g., Masten Xoie or the Armadillo Aerospace' Lunar Lander Challenge vehicle), and the spaceplanes that use the vertical takeoff, horizontal landing (VTHL) approach (e.g., the Space Shuttle, or the USAF X-37) which have landing gear to enable runway landings. Each vertical-takeoff spaceflight system to date has relied on expendable boosters to begin each ascent to orbital velocity. This is beginning to change. Recent advances in private space transport, where new competition to governmental space initiatives has emerged, have included the explicit design of recoverable rocket technologies into orbital booster rockets. SpaceX has initiated and funded a multimillion-dollar program to pursue this objective, known as the reusable launch system development program. The orbital-flight version of the SpaceX design was first successful at accomplishing a water landing (zero velocity and zero altitude) in April 2014 on a Falcon 9 rocket and was the first successful controlled ocean soft touchdown of a liquid-rocket-engine orbital booster. Seven test flights with controlled-descent test over-water landings, including two with failed attempts to land on a floating landing platform, have been conducted by April 2015. ^ National Transportation Safety Board (December 1998). "NTSB Aviation Coding Manual". Archived from the original on 4 June 2011. Retrieved 29 January 2012. ^ Bertorelli, Paul (1999). "Ditching Myths Torpedoed!". Retrieved 17 January 2010. ^ "Airbus Overhead Panel" (PDF). Data. smartcockpit.com. Archived from the original (PDF) on 30 March 2012. Retrieved 9 October 2011. ^ Kebabjian, Richard. "1956/1956-27.htm". PlaneCrashInfo.com. Retrieved 26 June 2006. ^ Hokom, Wayne. "Ditch and rescue". Coast Guard stories. Jack's Joint. Retrieved 26 June 2006. ^ "Aviation Safety Network: N6923C" Archived 23 April 2016 at the Wayback Machine. Flying Tiger Line Pilots Association. Retrieved 3 February 2014. ^ "Accident Details" Archived 3 March 2016 at the Wayback Machine. PlaneCrashInfo.com. Retrieved 3 February 2014. ^ Frederick C. Caruso (2007). Born Again Irish: A Story of Disaster at Sea, the Joy of Ireland, and the Vortex of Fate. CGI Books Inc. p. 1. ISBN 978-0-9785471-0-3. ^ Aircraft Accident Report: Douglas DC-7C, N285 Northwest Airlines, Inc. Ditching in Sitka Sound, Alaska October 22, 1962. Washington, DC: Civil Aeronautics Board. 19 September 1963. p. 1. ^ a b Sims, Ward T. (23 October 1962). "102 Saved As Plane Ditches". Seattle Post Intelligencer. ^ Aircraft Accident Report: Douglas DC-7C, N285 Northwest Airlines, Inc. Ditching in Sitka Sound, Alaska October 22, 1962. Washington, DC: Civil Aeronautics Board. 19 September 1963. p. 5. ^ AirSafe.com (28 March 2002). "Jet Airliner Ditching Events". Retrieved 26 June 2006. ^ Aviation Safety Network. "McDonnell Douglas DC-9-33CF N935F – St. Croix, Virgin Islands". Retrieved 26 June 2006. ^ "Collision with water – Piper PA31-350 Chieftain, VH-MZK, Spencer Gulf, S.A, 31 May 2000". Australian Transport Safety Bureau. 19 December 2001. ^ Garuda Indonesia Fl421 Archived 12 October 2007 at the Wayback Machine at AirDisaster.com retrieved 2 November 2007. ^ Mark V. Rosenker. "NTSB Safety Recommendation" (PDF). ^ Robbins, Liz (15 January 2009). "Jet Ditches in Hudson; All Are Said Safe". The New York Times. The New York Times Company. Retrieved 15 January 2009. ^ Hradecky, Simon (7 June 2011). "Accident: Solenta AN26 near Libreville on Jun 6th 2011, ditched in the sea". The Aviation Herald. Retrieved 5 September 2011. ^ Hradecky, Simon. "Accident: Angara AN24 at Nizhnevartovsk on Jul 11th 2011, water landing after engine fire". The Aviation Herald. Retrieved 11 July 2011. ^ "An-24 crash in Tomsk region now claims 7 victims". Lenta.Ru (in Russian). Lenta.Ru. 11 July 2011. ^ "Air Niugini plane crash turns fatal after divers find missing passenger's body". ABC News. 2 October 2018. Retrieved 3 November 2018. ^ "Lion Air Passenger Plane Crashes in Bali". 13 April 2013. Archived from the original on 15 April 2013. ^ Aviation Safety Net. "ST-APY". Retrieved 17 March 2009. ^ Aviation Safety Network. "Boeing 747–428 F-GITA Papeete-Faaa Airport (PPT), Tahiti". ^ Aviation Safety Network. "Boeing 747–409 B-165 – Hong Kong-Kai Tak International Airport (HKG)". Retrieved 26 June 2006. ^ Smith, Patrick (2002). "Ask the pilot #4: Do seat cushions actually save lives?". Salon.com. Archived from the original on 22 May 2006. Retrieved 28 June 2006. ^ Stokes, Henry Scott. "COCKPIT FIGHT REPORTED ON JET THAT CRASHED IN TOKYO Archived 2 May 2008 at the Wayback Machine," The New York Times. 14 February 1982. Retrieved on 10 November 2011. ^ World Airways, Inc., Flight 30H, McDonnell Douglas DC-10-30CF, N113WA, Boston-Logan Int'l Airport, Boston, Massachusetts, 23 Jan. 1982 (Revised) Archived 4 October 2012 at the Wayback Machine (AAR-85-06) Aircraft accident report by the U.S. National Transportation Safety Board, adopted 10 July 1985. ^ Boyle, Alan (18 April 2014). "Cargo Launch and Rocket Test Add Up to 'Happy Day' for SpaceX". NBC News. Retrieved 20 April 2014. ^ a b Bergin, Chris (3 April 2015). "SpaceX preparing for a busy season of missions and test milestones". NASASpaceFlight.com. Retrieved 26 April 2015. ^ Hanlon, Michael (11 June 2013). "Roll up for the Red Planet". The Telegraph. Retrieved 26 October 2013. the space race is flaring back into life, and it's not massive institutions such as NASA that are in the running. The old view that human space flight is so complex, difficult and expensive that only huge government agencies could hope to accomplish it is being disproved by a new breed of flamboyant space privateers, who are planning to send humans out beyond the Earth's orbit for the first time since 1972. ^ Foust, Jeff (18 October 2013). "SpaceX wrapping up Falcon 9 second stage investigation as it moves on from Grasshopper". NewSpace Journal. Retrieved 26 October 2013. ^ Klotz, Irene (17 October 2013). "SpaceX Retires Grasshopper, New Test Rig To Fly in December". Space News. Retrieved 26 October 2013. ^ Leone, Dan (13 May 2013). "SpaceX Leases Pad in New Mexico for Next Grasshopper Tests". SpaceNews. Retrieved 3 August 2013. ^ "Landing Legs". SpaceX News. 12 April 2013. Retrieved 2 August 2013. The Falcon Heavy first stage center core and boosters each carry landing legs, which will land each core safely on Earth after takeoff. After the side boosters separate, the center engine in each will burn to control the booster’s trajectory safely away from the rocket. The legs will then deploy as the boosters turn back to Earth, landing each softly on the ground. The center core will continue to fire until stage separation, after which its legs will deploy and land it back on Earth as well. The landing legs are made of state-of-the-art carbon fiber with aluminum honeycomb. The four legs stow along the sides of each core during liftoff and later extend outward and down for landing. ^ Belfiore, Michael (22 April 2014). "SpaceX Brings a Booster Safely Back to Earth". MIT Technology Review. Retrieved 3 July 2014. ^ Norris, Guy (28 April 2014). "SpaceX Plans For Multiple Reusable Booster Tests". Aviation Week. Retrieved 3 July 2014. Wikimedia Commons has media related to Water landings. Aviation incidents by result from the Aviation Safety Network; see Off runway in water, CFIT into water, and Ditching. Schiff, Barry (March 1983). "Water Ways". AOPA Pilot. 26 (3). Reproduced on Equipped To Survive. Ditching Myths Torpedoed, by Paul Bertorelli, cites data that show an 88% survival rate for general aviation water ditchings.